Prior to the elections, general concerns included high levels of youth unemployment; corruption and poor quality of public service; broken health systems; low quality and limited access to education; and an economy that has failed to take off and is now weakening. Other critical concerns were the nature of the state, its dictatorial tendencies, the centrality of the military in politics, and the calls for transformation. These were popular among the opposition, civil society, and pressure groups both locally and internationally. The campaigns were generally peaceful, guided by a comprehensive program drawn by the Electoral Commission. Massive crowds followed the three top candidates, and a new political term “organic crowd” (literally meaning followers without bribe) was applied to certain rallies of Kizza Besigye and Amama Mbabazi which showed the people have an appetite for change. The donation of money from ordinary citizens to Dr. Kizza Besigye—popularly referred to as “The People’s President”—underlined this. Instances of a hostile political environment were reported. Police intimidation, harassment, and arrests of opposition politician and supporters were witnessed. The shrewd and tenacious leadership of President Museveni created limited campaign opportunities for the opposition candidates. State officials and resources were used for campaigning for the incumbent. This blurred the distinction between the state and the NRMO party, and more critically, Uganda yet again went into elections with the same contested electoral body over its credibility and partisanship. Attempts to reform the electoral commission in the period preceding elections were viciously avoided by government. 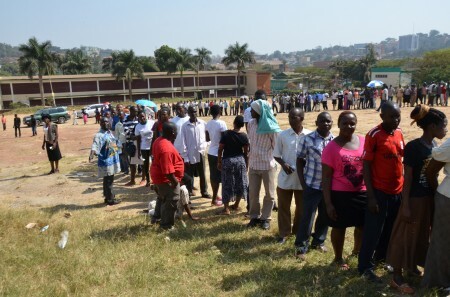 The polling day was characterized by an excessive delay of over five hours in delivering voting materials in many polling stations (particularly Kampala and Wakiso)—a situation that resulted in disenfranchising many citizens. Accordingly, it is reported a record thirty seven polling stations failed to conduct elections. A number of incidences of pre-ticked ballots in favor of the incumbent were either intercepted or discovered in various locations around the country, with most culprits being police, NRM politicians or paramilitary-crime-preventers, who were also deployed to intimidate voters. Cases of discrepancies in the voter register with irreconcilable tallies of votes in polling stations were common so that computed total votes were much higher than original number of voters registered in a polling station. It is believed that this was caused by the addition of ghost voters into the national voter register prior to elections. Indeed, many opposition voters were tuned away from the polling stations while unknown people voted on their behalf. In the districts of Kampala, Wakiso, Dokolo among others, names of candidates and their political symbols were mixed up in the ballot papers. Uganda is a democracy with a constitution, with over twenty registered political parties and several laws governing its electoral processes, with the Electoral Commission (EC) organizing, conducting and supervising elections. Yet the EC has been shown to have inadequate capacity to administer credible elections. It has failed to create a comprehensive voter registration, and it has been accused of acting secretively. Critics argue that the commission does not provide timely information and space within which electoral programs could be discussed by the population and stakeholders. Late introduction of Biometric Voter Verification Systems, Voter Location Slip, and the new modalities in the Voter Registry did not have thorough civic education and debate among political parties thus reinforcing suspicion of the electoral body. The EC failed to dispatch election materials timely to polling stations around the country. Voting exercise was delayed by nearly six hours affecting the entire electoral process. Consequently, thirty seven polling stations did not conduct elections and final results announced excluded a total of 1,787 polling stations that couldn’t be included because of the 48 hours deadline. There have been allegations that they were left out intentionally because of opposition strong support in those areas. Experiences from the past three democratic elections indicate a number of weaknesses with electoral laws and the conduct of elections in the country. They are all reflected in the election observers’ report of the subsequent elections. The electoral commissioner is appointed by the president with the approval of parliament, though the process is contested widely. The Police Chief, the Electoral Commissioner and some of his staff have been observed exhibiting partisanship. A number of civil society groups, the Law Society of Uganda, and opposition parties have made attempts to reform the electoral commission in vain. Indeed, basic freedoms enshrined in Article 29 (1995 Constitution) on rights to freedom of speech and expression and Freedom of Press Media and Access to information were breached. Access to campaign venues were denied to Kizza Besigye and Amama Mbabazi; several times, the candidates were blocked from speaking to the people. State media and information outlets were also unevenly accessed throughout the campaign. In contravention of Article 67 (2) of the Constitution that provides for no candidate to be denied access and use of state owned communication media, and Article 67 (3) that states Presidential candidates must be given equal time and space on state owned media to present their program to the people. The nature of leadership challenges in Uganda demonstrated during the elections requires special attention by development partners and the international community to carefully revisit modalities of engaging functional states in attempts to consolidate democracy. This leadership crisis takes place within a complex context involving the military which is firmly entrenched in Uganda’s politics. Since independence, Uganda has experienced a complex political history characterized by massive and systemic elimination of civil liberties, gross human rights violations, sabotage of democratic governance with the substitution of it with one party system of governance, and, most recently the establishment of multiparty politics in play today. The current democratic governance was ushered in by President Museveni’s government but happened through the hard work of opposition political parties, stakeholders, and pressure from western powers to democratize. The country has struggled to adhere to some democratic principles. The seriousness of the problem lies in the complexity of governance and leadership styles that swing between outright dictatorship and authoritarianism, and yet retains certain democratic traits. Its persistence is a threat to genuine democracy and sustainable economic development. President Museveni—a historian by training, a “reformed rebel leader,” and well-schooled in African politics—has mastered the art of balancing illiberal and outright dictatorship while retaining democratic traits. Crucial to this has been the merging of the state and the regime over the last 30 years. Power within government is highly concentrated in key ministers who are all personally and politically close to the president and subsequently leave many regions of the country without representation. Power and patronage is simultaneously oiled by corruption and the use of repression. In other words, the regime’s stronghold has predominately rested on patronage, corruption, and recently the militarization of politics. Three observations of which are briefly discussed below. The first observation points to a highly centralized and all powerful presidency anchored on a unique marriage of military and politics. From the year 2001, a new military political influence emerged. It either added or changed the meaning and role of security apparatuses. This relationship has undermined the conventional significance of the military in politics as a defender of the people, its territory, and its sovereignty. First as commander in chief, the President has used this power unconstitutionally. Second, as an executive arm of government for protecting the territorial integrity of a country, he has turned it into an instrument of aggression against anti-regime sentiment. This is evidenced in police and military aggression on opposition in 2001, 2006, 2011, and this year’s general elections. It also includes formation of non-state armed groups such as kiboko squad, black mamba and the recent controversial crime preventers that have been seen cracking down on opposition and cultivating fear. Yet while the military wields enormous power, the trade-off is that Museveni’s regime has created a more stable and peaceful country in comparison to the past. Museveni’s leadership has not experienced a coup, nor has the highly militarized state drifted into a situation like Nigeria suffered in the 1980s-90s, which was characterized by military mutiny and indiscipline. Much of this has been achieved through steps taken to professionalize the army and establish a functional though imperfect military court. The second observation pertains to the apparent systematic police and military blurring of work jurisdictions and the question of homogeneity of the national defence force. The creation of Uganda’s Peoples Defence Force (UPDF) had its beginning as the National Resistance Movement, a “reform” rebel movement that took over power in 1986 under Museveni’s leadership, and continues to be led by him— he often refers to it as “my army.” It is impossible to talk about the UPDF without it also meaning Museveni. Nevertheless, the army has transformed itself from a resistance movement into the national force that we have today. But the military still retains partisan traits. This means the democratic challenge at hand goes beyond the consolidation of legitimate and institutionalized civilian control of the military. The third and most important observation is the military’s geopolitical imperative in the area of peace and security. In the recent past, a description of “security philanthropist” would be accurate for Uganda People’s Defence Force. In a time when countries like South Sudan, Democratic Republic of the Congo, and Somalia—that have weak or fragile state functionality in the context of conflict—are unable to adequately defend territorial sovereignty nor create security for its people, President Museveni became a regional leader in peace and security by deploying UPDF troops in peacekeeping and countering terrorism efforts in many countries in the East and Central African region. More recently in 2014, President Museveni’s swift and timely deployment of UPDF in troubled South Sudan arguably saved the world from witnessing another genocide. In addition, Uganda has been home to thousands of refugees from the conflict troubled neighbors through the years. These refugees are generally treated as equal to other citizens, and some have acquired land. This strategic regional security leadership has resulted in Museveni’s enjoyment of a close relationship with Western powers such as the United States, thus defining the geopolitical strategic relevance of President Museveni. Whether this can be used to explain the seemingly little attention USA and other western powers give to Museveni’s dictatorial tendencies may be too simplistic a conclusion, but one would be considered naïve to ignore it. The issues discussed above are inseparable from the economic development of the country. The country has enormous potential to develop, particularly in the agricultural sector and the newly discovered oil. But these opportunities are undermined by a culture of opportunistic patronage and rent seeking, causing failure of policies to stimulate growth. Likewise, investments in sectors like gold, oil, agriculture lacks inclusive coherent coordination that would maximize their production and make them part of a sustainable development plan. As with some countries across Africa, the hopes that swept the continent in the early 1990s, hopes of achieving freedom—press freedom, freedom of association, among others, through democratization—have been dashed. Uganda’s solutions in the immediate future are dire, but long-term prospects are less somber. Ethiopia and Rwanda’s “developmental patrimonialism” in which their respective leaders have achieved much for their citizens on economic principles could perhaps offer insights to Uganda’s future. Former presidential candidate and now prisoner Besigye’s challenge to the international community to reject the outcome of elections, saying, “at least have the courage to admit you do not care about democracy or human rights in Africa,” is quite telling of how countries perceive the USA and the West‘s engagement with African countries on issues of democracy. The focus on democracy is important, but what is more important is a leaders’ effectiveness to transform citizens and the nation. Effective leadership prevents manipulation, coercion, and bribery, and embraces mutuality to act according to the wishes of the people. Effective leadership creates a culture that unlocks the immense potential of people with policies and programs that can achieve mutual personal, collective, and national goals. These democratic benchmarks should be used when evaluating a leader’s effectiveness, and not just make democracy about elections and the presence of democratic infrastructures. Finally, while it is important for the conversation on transparency, accountability, and human right to continue, it is true that these principles cannot be achieved immediately. Fundamental reforms in the security sector must be a priority to embrace democratic principles, without which there can be no meaningful peace, development, and representative system of governance. There needs to be comprehensive and coherent external accountability and oversight of the military, to build trust with national and local leadership of security and create an indispensable confidence-building framework that can overcome suspicion between the security sector and the civilian population. See Section 22, Parliamentary Elections Act No. 17 of 2005; Article 3(g) and Article 3(j). Julius Kaka is a Peace and Security Fellow at the African Leadership Centre, Kings College London. He is also a junior academic in the Department of History, Gulu University, Uganda.